It is easy for exercise to get boring fast, even if the routines seem enjoyable at first. That is because more often than not, exercise routines become stale. However, this can change. 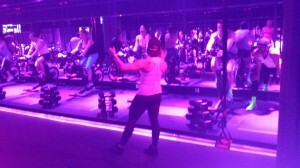 At Vida U Street, members of the media had the chance to catch a sneak peek of a new feature in the building, SweatBox, which will be made available to the public on May 4. First of all, make sure that, should you attempt this workout, you are dressed appropriately for the occasion because various people will express concern about your attire if your outfit includes jeggings and boots. A gym t-shirt, stretchy leggings, and sneakers will make it a lot easier to do the exercises. Every person in the room has three sets of items. Those items include a bicycle machine, weights, and exercise handles that hang from the ceiling. The exercise session is calm at first, with attendees given the opportunity to set up their bike machines with the settings they desire, such as weight, age, and how much cardio they do per week. However, those settings aren’t saved so it’s a little inconvenient to have to put in the same information each time the bicycle machine is used. Then things start to heat up in the exercise room. This workout is a challenging one to do. Even for someone who has been on a real bicycle, the speed and pace that is expected varies and (ideally) needs to be maintained for a period of time. The weights are only used for a short time and the handles get used in a lot of ways, including in stretches where the exercise handles are connected to the feet, which can be difficult to do for beginners. The instructors are very nice and helpful and want to help you face the challenges at your own pace. However, one of the instructors said that even for those who master the moves, more challenges will come their way if they choose to continue attending SweatBox workouts. This is a great workout for Type A personalities who need to learn how to relax, but still feel as though they are accomplishing something important.